Bronchitis is a very common condition. Is it contagious? It depends on the type of bronchitis you have (acute or chronic). Read to learn the answer. 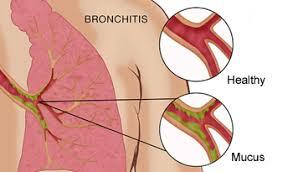 Bronchitis refers to the inflammation of bronchi, the main air carrying passages to the lungs. Based on the duration of the illness, bronchitis is differentiated into acute bronchitis (short-lived) and chronic bronchitis (long lasting and/or recurring). There is no single answer to this query. Bronchitis can be both, contagious and non-contagious, depending upon the cause of the bronchitis. Infectious bronchitis, i.e. those caused by viral infections or bacterial infections is contagious. These infections result in acute bronchitis or acute exacerbations of chronic bronchitis. Chronic bronchitis is a very different disorder and it is non-contagious. However, acute exacerbations of chronic bronchitis caused by superimposed infection in people with chronic bronchitis might be contagious. Is bronchitis contagious? Let's first look at acute bronchitis. It is an acute respiratory tract infection. In nearly 90% of the cases, an acute bronchitis is caused by a viral infection (influenza virus, rhinovirus, respiratory syncytial virus, etc.). Acute bronchitis due to bacterial infection is relatively rare. Acute bronchitis is usually considered contagious as long as the symptoms are present. In certain people with preexisting heart or lung disease (e.g. asthma), an episode of acute infectious bronchitis might be caused by less virulent strains of infectious agents which fail to cause acute bronchitis in normal individuals. Such bronchitis is non-contagious, but it is almost impossible to differentiate more virulent strains from less virulent strains based on symptoms alone. Hence, bronchitis in such cases is less likely to be contagious. Is bronchitis contagious? What about chronic bronchitis? Chronic bronchitis is very different from acute bronchitis. It develops due to continued irritation and inflammation of air passages over a course of many years. Smoking and prolonged exposure to polluted air are the most important causes of chronic bronchitis. Chronic bronchitis is not contagious unless there is a superimposed acute exacerbation caused by infectious agents (acute exacerbations of chronic bronchitis). The contagious acute bronchitis can be prevented by avoiding contact with the infected person. Sharing of personal items should also be avoided. Vaccination against the commonly found strains of viruses is also helpful in prevention of acute bronchitis. The affected persons should cover their mouth while coughing and sneezing and try to avoid contact with healthy persons. They should also maintain adequate personal hygiene, for e.g. regularly washing their hands etc. To prevent chronic bronchitis, exposure to polluted air should be avoided (whether as cigarette smoke or industrial pollutants). If you or your child brings up the point, “My chest hurts when coughing,” it may not be dangerous. However, severe chest pain or trouble breathing can be serious.